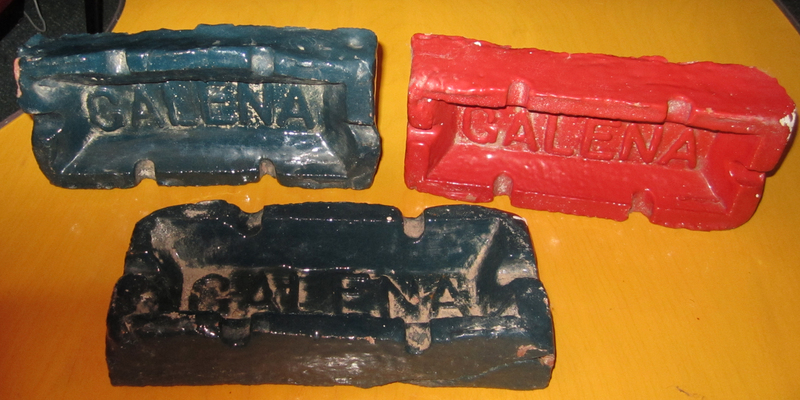 "In our house in Maryland we have several bricks or molds with the word "Galena" in them. The objects are rectangular, fired or painted glossy green, concave with word "galena" raised up within. Flat bottom is not painted but looks like brick. On the sides are indentations similar to what you would see on an ashtray. Would this be a galena brick mold? Marketing ashtray for Galena?" inquired Diane Mitchell. Galena Brick historian, Gene Fuller gave the following answers to Ms. Mitchell's inquiry. During the 1960's and early 1970's we produced a full line of Ceramic Glazed Sand Mold Brick. In the wall they had the appearance of a glazed ceramic tile only in a "rustic brick face" We produced them in a variety of colors and since they were very expensive we sold most of them to large corporations for their office buildings. For example we manufactured several thousand for the offices of Dutch Boy Paint Company in their blue logo color for the entrance to their new (in 1968 ) offices. We also sold many truckloads for the airport in Pittsburgh, and the Stouffer Food Plant in Cleveland, and many other projects around the country. In order to promote this type of brick we had a "special mold" designed to produce ash trays. We gave them to Architects to place on their desk as a reminder of our products. (In those days a lot of people smoked.) The bottom or unglazed side had a piece of felt adhered to it to prevent scratching the table or desk. This is what she has. Some of the ash trays were not as good as others and we gave some of them to employees and contractors.